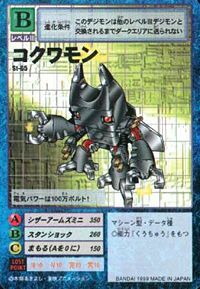 A very unusual Insect Mecha-Digimon that was recently discovered. 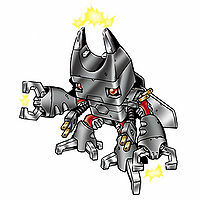 Insect Mecha-Digimon had not been discovered until now, and their existence itself was never even imagined. Because it will discharge 1 MV of electricity from the stun gun-shaped head and arms it possesses if it senses danger, you mustn't carelessly approach. However, it has not an aggressive personality, but a docile personality which seeks tranquility. 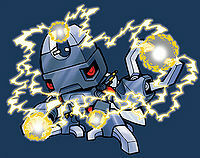 It uses electricity as its source of nutrients, and charges electric power using its middle two legs. Its Special Move is discharging electricity from the pincers on both of its arms and cutting through solid objects (Scissor Arms Mini). 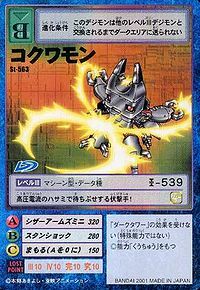 A Machine type Digimon. It releases a million volts of electricity when it senses danger. Its Special Move is Scissor Arms Mini. 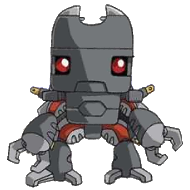 — Digimon Frontier: "Thunder Power Shaking the Ground, Blitzmon!" n., Short for kuwagatamushi (鍬形虫), meaning stag beetle. Scissor Arms Mini  シザーアームズミニ Shizā Āmuzu Mini Mini Scissor Claws Slices foe with its electrified pincers. Assemble Work  アッセンブルワーク Assenburu Wāku Dis-Assembler Uses electromagnetism to gather scrap metal and throw it, or simply slices the foe with its pincers. 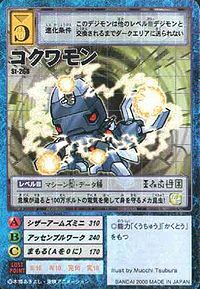 Elect-Elect  エレクトエレクト Erekuto-Erekuto Electro Strike Drops lightning on the enemy. 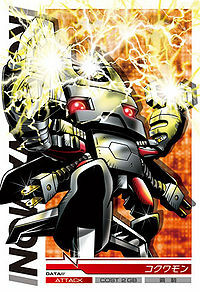 Stun Shock  スタンショック Sutan Shokku Power Surge, Stun Shock Electrocutes the enemy with the top of its head like a taser. In Digimon Frontier - Episode 05, a group of Kokuwamon worked in a factory run by Goburimon and owned by Snimon as slaves. When Takuya and the others, excluding Kouji, appeared they made a plan to free the Kokuwamon. 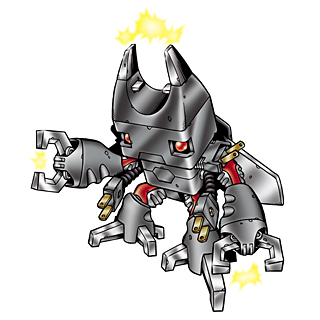 However when Snimon appeared Agnimon couldn't defeat him. 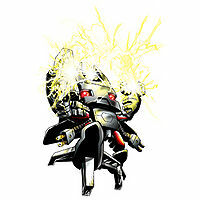 Junpei who had been feeling as though there wasn't a use for him proved himself the hero by finding the spirit of thunder and spirit evolving into Blitzmon for the first time and defeating Snimon. The Kokuwamon were consequently freed. Kokuwamon is a playable card. Kokuwamon is only obtainable as a collectible card. Its card is part of the Kuwaga Nine (クワガーナイン Kuwagā Nain) set. Kokuwamon is available as a Digimon Medal. 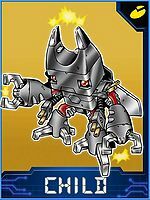 Kokuwamon is available as a Digimon Card. Evolves from Caprimon. Can evolve to Revolmon, Tankmon, Clockmon or Guardromon. Evolves from Caprimon. Can evolve to Revolmon, Thunderballmon, Clockmon or Guardromon. Kokuwamon is an enemy Digimon. Its electrical power is 1,000,000 volts! Although it's small, it's full of electricity! It can emit 1,000,000 volts from its claws! Always carefree, it rests at an electrical outlet when it gets hungry. This mechanical insect emits a million volts of electricity to protect itself when it feels danger encroaching! This assailant waits to ambush the enemy with its high-voltage pincers! 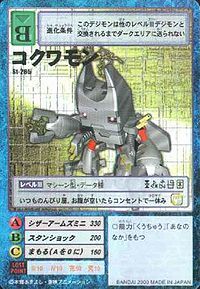 A mini insect type Machine Digimon. It stores electricity in its body and can even use it to make electrical appliances work. When it senses danger, it protects itself by releasing an electric current of 1 million volts. 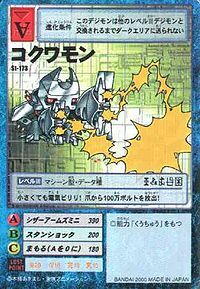 ↑ Kokuwamon was adopted from a winning Digimon entry in the First Original Digimon Contest (Digimon Web).